I took your advice and purchased Acronis True Image to backup my computer's hard drive (using disk image backups). My question is: how can I be sure the disk image backups are not corrupt and will properly restore, if and when I need to do a restore? What is the best way to do a test restore of a disk image backup? " You are not the only person to ask me how to restore a disk image backup -- and it's an excellent question to ask. The simple answer is that you need to run through the entire process of a restore in order to ensure that everything will work as it should, if and when the time comes. If you do not test the disk image restore process in this manner, there is no way to know that the restore will work. This is true for all backup software. Initially, I suggest you test your first disk image restore using a second hard drive, if you have one available. If there are any complications, the original drive will remain unaffected. In this case, the secondary drive will need to be at least the same size or larger than the original. I also suggest you do not keep the original drive attached to the system to avoid overwriting it by accident. When it comes to restoring a disk image (especially for testing purposes), you should always replicate the restore environment as closely as possible for both source and destination disks. For example, do not use your external USB hard drive as your destination disk as a way to "mimic" writing to the C drive. There are many reasons for this; one reason is that Acronis may not recognize your external USB hard drive as the destination disk, so the restore will fail from the get-go. The second reason is that even if you do successfully restore a disk image to an external USB hard drive, Windows most likely won't be able to boot from the USB drive because Windows is not meant to boot from USB. To replicate the restore environment as close to the original as possible, you will need to replace the original drive with a secondary drive, which also means you will need to open up your PC or laptop to make the switch. Once you have tested the restore procedure and everything is as it should be, then you can swap everything back. Now you can rest assured that the next time you make a restore (for real), it will work. The first thing you need to do is validate your backup, which are stored in .TIB (True Image Backup) archive files. Usually these files will be stored onto an external USB hard drive or DVD. By validating the backup, you will ensure the archive and the backup media is error-free before proceeding with a restore. For example: if you wrote your disk image backup to 10 DVDs and the 10th DVD has a read/write error, then the entire backup will fail. This has happened many times to me in the past, so if you are backing up onto DVD, you will absolutely want to test each and every disc you burn before storing it away safe keeping. Another reason a backup will fail is if you have a dirty file system (usually on an external or internal hard drive). As such, you should always check your hard drive for errors using CHKDSK (check disk) before writing your image files. If you're backing up onto an external hard drive, always safely unplug the device before detaching the USB cord from the computer, or you will risk corrupting the drive and its contents (also resulting in a failed backup). 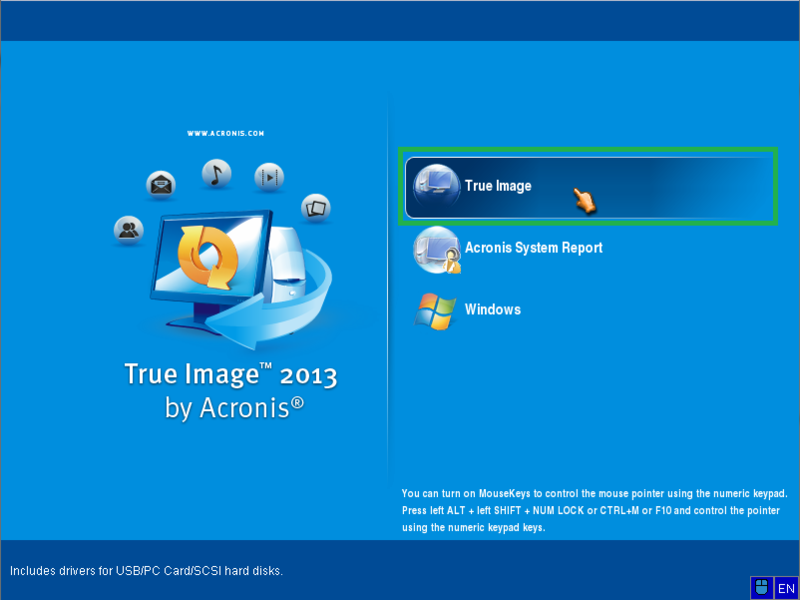 After you have validated your disk image archive and media, the next thing to do is to launch Acronis True Image and enable the Acronis Startup Recovery Manager via the Tools and Utilities Menu. This modifies your hard drive master boot record (MBR) and allows you to load the Acronis Backup / Restore (Linux) environment by pressing the F11 key during the boot process. This is especially useful in case Windows cannot boot on its own, as you can still proceed with a restore if you need to. The Bootable Rescue Media is similar to the Startup Recovery Manager, except you are starting the environment from CD, DVD, or USB flash drive instead of pressing F11 at boot (which typically executes the environment from your hard drive). You will need bootable rescue media if your hard drive master boot record (MBR) is corrupt or missing. An MBR can go corrupt from virus infections (such as the Rombertik virus), or other strange phenomenon. If you are restoring your disk image backup onto a secondary hard drive with your original drive unplugged, you will also need Bootable Rescue Media. Once you have enabled the Startup Recovery Manager and have created your Bootable Rescue Media, you will want to test both environments to ensure they are both operating properly before attempting to restore. To do so, restart your PC and wait until you see the message "Press F11 for Acronis Startup Recovery Manager..."; at this point press F11 repeatedly until you get to the blue screen where you can choose to boot either Acronis True Image or continue loading Windows. To test the Bootable Rescue Media, reboot the computer with your DVD or USB Bootable Rescue Media plugged in. If it doesn't boot by itself, you will need to adjust your BIOS boot sequence so that the USB / DVD drive attempts to boot before the hard drive. For Windows 8 users with UEFI enabled, refer to this article on how to boot from USB using Windows 8. Once inside the Acronis environment (Linux), select Restore and choose the backup archive set you created previously. Then, select the destination hard drive (partition) to restore to. 1. Do not finalize the restore (I.E. : do not click the Proceed button). If you got as far as being able to select the disk image to restore and you were able to see your source and destination hard drive partitions, chances are the restore will work. The most common problems users encounter during a restore procedure is that they cannot select from either the source or destination disk because the Acronis Linux Environment cannot detect / see the hardware. If you don't have a second hard drive to write your 'test' restore to, then you will most likely want to abort here and pray that it will restore when the time comes. 2. Optionally, you can proceed with the restore. For testing purposes, I advise you only proceed with the restore if and only if you are writing to a secondary hard drive and that your original drive is unplugged (to avoid accidentally writing to the wrong drive). Once the restore completes, you can swap everything back and rest assured everything is as it should be. You should never need to do another 'test restore' again using a second hard drive, because it should work just fine with the original drive. If all of this is over your head and you need help setting up Acronis True Image on your system (and testing the procedure), you can contact me for remote desktop support and I will set it up for you. Very useful! Infopackets is one of the very best sites I know.